Once upon a time back in 1953, a famous British sea captain by the name of Capt. George Soule sailed from his native island of Barbados on a quest to find the ultimate Caribbean cocktail. He searched Guadeloupe for Guava Gimlets, Saba for Sour Sop Sodas and Martinique for Mango Margaritas. 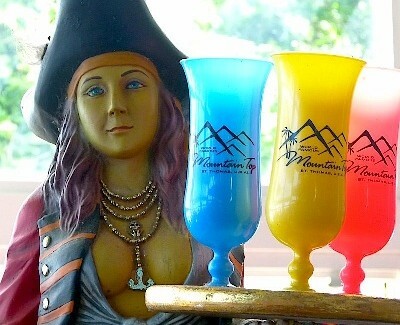 His quest ended on the island of St. Thomas in the U.S Virgin Islands at a place called Mountain Top. The captain had finally discovered the perfect island beverage. Mixing the Virgin Islands’ own Cruzan Rum, sugar cane extract and ripe bananas from a nearby grove, he added fresh lime juice and a homemade secret banana liqueur. Capt. Soule had created the now world famous Banana Daiquiri enjoyed by more than 10 million visitors to the popular Mountain Top. At least, that’s the tale that a Mountain Top bartender told me as he mixed one of the sweet cold concoctions. It may be true. Maybe not. But the drink is certainly tasty and the view from Mountain Top is well worth the trip. With five cruise ships – from my count – docked at St. Thomas, it wasn’t surprising to see so many cruisers heading up the mountain on island shuttles. Tourism is the No. 1 industry in the Virgin Islands. Our shuttle driver “Toothpick” (because I’m so skinny”) expertly guided the vehicle up the narrow road to the highest peak on the island and gave us a history lesson at the same time. We were so close to toppling over the side of the teeny road that I was glad I wasn’t driving. Mountain Top boasts a big duty-free shopping mart filled with tons of souvenirs, clothing, jewelry and other stuff, plus a clean restroom and a bar that serves the famed banana daiquiris. But it was the amazing view that captured my time. Mountain Top is the perfect place for photos. On a clear day, the bartender said, you can see San Juan. That story, I know, is true.